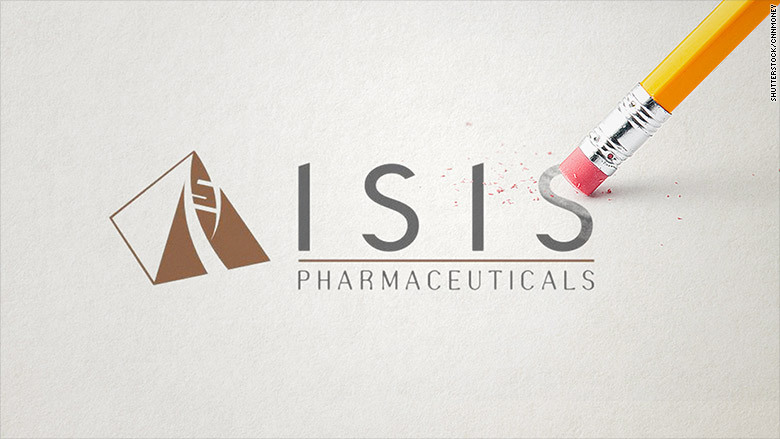 Isis Pharmaceuticals is tired of sharing a name with the terrorist group that carried out horrific acts of violence in Paris last week. The California biotech company is named after an Egyptian goddess associated with good health. But most people these days clearly do not think about an Egyptian goddess when they hear the word "Isis." That's why Isis Pharmaceuticals (ISIS) told CNNMoney on Monday it's now considering changing its name. No final decision has been made and it's not yet clear what new names are being discussed. "Even though people know we're not associated with the terrorist group, the name itself has so many negative connotations," said D. Wade Walke, the company's vice president for corporate communications and investor relations. "It's obviously not getting better over time." He said the "awful tragedy" that killed at least 129 people in Paris "weighs on us quite a bit." Isis makes drugs aimed at treating cancer, heart disease and neurological disorders such as ALS, which is also known as Lou Gehrig's disease. The company last year told CNNMoney it felt no pressure to change its name or stock ticker symbol, which is "ISIS." Isis didn't think the name was a problem previously because it doesn't sell directly to consumers. Institutional investors had indicated to the company that the name wasn't an issue for them. However, Walke now admits, "subliminally it can't help." Shares of Isis dropped 4% on Monday despite a broad rally on Wall Street. The company didn't release any major news that would have caused the stock drop. It's not clear if the selloff was linked to the Paris terror attacks that ISIS has claimed responsibility for. Walke said the stock drop may have been associated with Clovis Oncology (CLVS), a rival that also makes cancer drugs. The drug maker's shares plummeted 70% on Monday after saying the FDA has requested more data on Rociletinib, its lead drug candidate. Several users on StockTwits, a social network for traders, debated the merits of a name change. "Have they considered changing at least their ticker symbol? Bad century to have this," wrote StockTwits user JSears68. CNNMoney's Paul R. La Monica contributed to this report.